Selling your used (or like-new) photo gear through the BAA Blog or via a BAA Online Bulletin is a great idea. We charge only a 5% commission. One of the more popular used gear for sale sites charges a minimum of 20% plus assorted fees! Yikes. The minimum item price here is $500 (or less for a $25 fee). If you are interested please e-mail with the words Items for Sale Info Request cut and pasted into the Subject line :). Stuff that is priced fairly–I offer free pricing advise, usually sells in no time flat as did Dennis Cassidy’s 500 II recently on the blog. Larry Master’s 400 DO and his 800 f/5.6 sold within a week. From Larry via e-mail: Thanks for helping me sell the lenses so quickly! A Creative Adventure/BIRDS AS ART friend Kitto Kono sold her Nikon 500 to a Blog subscriber in less than a week. Janet Horton’s 7D sold this week after a $100 price reduction. Denise Ippolito’s 100-400 and her 100 macro sold in one day. Peter Kes sold his 70-200 f/2.8L IS II and his 400 DO through BAA in ten days. In the past two months we have sold a Canon 800, a Canon 500 II, 3 400 DO lenses, a Nikon 500mm, and lots more. If you are interested in using our services, please e-mail. This post marks 162 consecutive days with a new educational blog post. With so many folks getting in the habit of using our B&H links and our Amazon logo-links why quit now? April was a record month! To show your appreciation for my efforts here, we do ask that you use our the B&H and Amazon affiliate links on the right side of the blog for all of your purchases. Please check the availability of all photographic accessories in the BIRDS AS ART Online Store, especially Gitzo tripods, Wimberley tripod heads, and the like. We sell only what I used, tested, and can depend on. We will not sell you junk. We know the tools that you need to make creating great images easy and fun. And we are always glad to answer your gear questions via e-mail. This image was created at Fort DeSoto Park in the shade with the slightly lowered Gitzo 3532 LS carbon fiber tripod, the Mongoose M3.6 head, the Canon EF 600mm f/4L IS II USM lens, Canon Extender EF 1.4X III, and the Canon EOS-1D X. ISO 400. Evaluative metering +1/3 stop as framed: 1/200 sec. at f/6.3 in Manual Av mode. AWB. Four sensors up from the central Sensor/AI Servo-Surround/Rear Focus AF as framed active at the moment of exposure. I keep Orientation-Linked AF active at all times and find it very helpful. Learn about this CF and everything else there is to know about the 1D X and 5D III AF systems including how to manage the various AF Area Selection Modes, when to use which one, and several ways to move the AF sensor around in the 1D X AF Guide and the 5D Mark III User’s Guide. Click here to see the latest version of the Rear Focus Tutorial. Click on the image to see a larger version. . Many folks are reluctant to add a TC or to change TCs in the field. I routinely do either and both dozens of time each day. Just be sure to turn your camera off when doing so. I always remember to do that. But most of the time I forget to turn it back on. 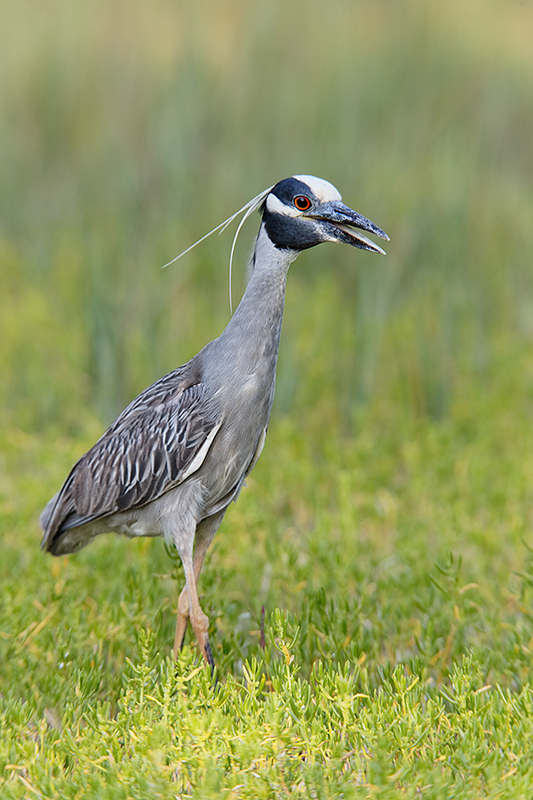 🙁 Above, I began with the 600/1.4X combo to create a vertical portrait of this obliging adult Yellow-crowned Night-Heron. Then, after the four of us–Denise Ippolito, Brent Bridges, Mary Anderson, and yours truly had our fill of portraits, I switched out the 1.4X TC for the 2X TC and moved in for a tight head shot. 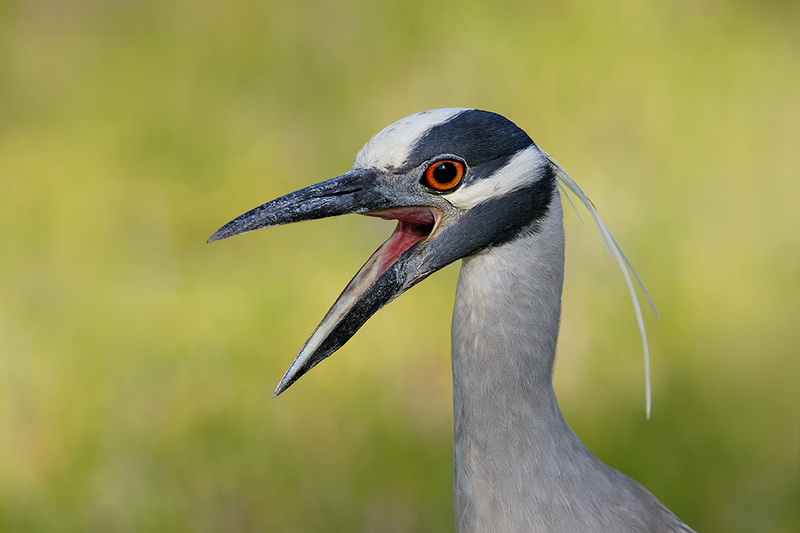 When the bird yawned, I got the active sensor on the lower mandible and created two frames. The first one, above, was the sharpest. Variety is the spice of bird photography. This image was created at Fort DeSoto with the Gitzo 3532 LS carbon fiber tripod, the Mongoose M3.6 head, the Canon EF 600mm f/4L IS II USM lens, the Canon Extender EF 2X III, and the Canon EOS-1D X. ISO 400. Evaluative metering +1/3 stop as framed: 1/320 sec. at f/11 in Manual Av mode. AWB. Central Sensor/AI Servo-Expand/Rear Focus AF as framed was active at the moment of exposure. When you add the 2X TC to an f/4 lens with the 1DX or the 5D III hit the MFn button once to toggle to AF Expand and enjoy 4 extra AF sensors. Learn everything there is to know about the 1D X and 5D III AF systems including how to manage the various AF Area Selection Modes, when to use which one, and several ways to move the AF sensor around in the 1D X AF Guide and the 5D Mark III User’s Guide. Click here to see the latest version of the Rear Focus Tutorial. Click on the image to see a larger version. . Which of the two images above is the strongest? Please leave a comment and let us know why as well. The Fort DeSoto Site Guide describes several locations where you can look for today’s featured species. I had checked this spot in the morning for naught, but in the afternoon the second time was the charm. You can get yourself a copy of the Fort DeSoto Site Guide here. Learn the best spots, where to be when in what season in what weather. Learn the best wind directions for the various locations. BAA Site Guides are the next best thing to being on an IPT. You can see all of them here. Used Canon 100-400mm f/4.5-5.6L IS USM Lens for Sale/Price Reduced $100! Multiple IPT veteran Bill Wingfield is offering a Canon 100-400mm f/4.5-5.6L IS USM lens in excellent condition for $1325! The glass is clean and the lens is in perfect working condition. The sale includes the lens hood, the fabric case, and insured shipping by UPS Ground to US addresses only. Personal checks only; your new lens will be shipped after your check clears. For me definitely the 2nd image, why? Intimacy.. The close up, the head angle, open mouth and the overall great detail, makes the viewer into a new level of information! P.S: A few days ago, you`ve suggested to join the UK Puffins IPT, and just to say i would really enjoy doing it, but the lack of time(€€) forces me to wait for better days. Hi, Artie. Now you have a full major-league baseball season’s worth of consecutive blogposts. You’re the Iron Man of educational photography blog posts! Congratulations and thank you. I like the second image better for its clarity, sharpness, and interest to me. I like the head portrait best, more exciting, for me. Both shots are excellent. By itself the first shot of bird in midstride is strong for movement alone. One can visualize seconds before and after as this bird majestically strode along his way. What really makes this shot is the bird’s attitude. Tilt of head and open beak gives personality to the shot. The strength of this shot is in the head. And it is the close-up, second shot that takes bird personality to a new high. Head is tilted more toward camera, and the mouth is much more open. It shows an interesting red tinge in that mouth which draws my eye to the analagous orange-red of the bird’s eye. Rhythm goes from left to right which is also a plus. And this bird’s eye is more vibrant than the one in the first shot. Both good images, I think I prefer the first the mouth open while walking seems unusual and the setting is nice. As for the exposure I guess the background is lighter? Why do you turn the camera off when changing TCs? I don’t think I ever have done. Background is pretty much the same. See my answer to Andy below. Turning the camera off cuts way down on sensor dust problems…. Yes, there was some bill clean-up in both images. Both sweet images, but I’d take the close shot if I had to chose. This shot nicely captures the energy of this bird. Love the head angle , nice view of the inside of the mouth and that very cool feather on the back of the head. Once question: Why is the exposure so different? I understand f11 for more DOF in the tighter shot, but I’d expect a slower SS or higher ISO (unless the light increased of course). Thanks for these blogs.